The myth of Psyche and Eros is probably one of the most beautiful Greek myths; it has been told and retold in several different versions and it has inspired artists all over the world. The archetype of the Greek myth of Psyche and Eros appears regularly in movies and artifacts even today. Psyche was a woman gifted with extreme beauty and grace, one of the mortal women whose love and sacrifice for her beloved God Eros earned her immortality. Psyche became, as Greek word “psyche” implies, the deity of soul. To modern days, the myth of Psyche symbolizes a self-search and personal growth through learning, losing, and saving the real love. Living her ordinary life, Psyche became famous because of her beauty that the whole world rushed to see. Being jealous due to men’s admiration for Psyche, Goddess Aphrodite asked her son, the powerful master of love, Eros, to poison men’s souls in order to kill off their desire for Psyche. But Eros also fell in love with Psyche and was completely mesmerized by her beauty. Despite all the men coming her way, Psyche stayed unmarried, but she wanted to marry the man she would love. Her parents became so desperate because of their daughter’s destiny and had no choice but to ask for an oracle, hoping that they would manage to solve the mystery and give a husband to their daughter. Eros guided Apollo to give the oracle that Psyche would marry an ugly beast whose face she would never be able to see, and he would wait for her at the top of the mountain. It was not what Psyche’s parents were hoping for; on the contrary, they were completely devastated, as their daughter was not supposed to have such as fate, but they decided to go on and arranged the wedding of their beloved daughter with the beast. After the wedding, Psyche was able to be with her husband only at night. His tenderness and the enormous love he showed to her made Psyche happy and fulfilled beyond her expectations and dreams. She talked about her happiness with her sisters and confined in them how sad she was she couldn’t see his face. Hence, the jealous sisters persuaded Psyche that her lover is not only an ugly beast but also a monster who would eventually kill her, so she should kill him first to save herself. With the oil lamp and knife in her hands, Psyche one night was ready for murder, but when she enlightened the face of her beast-husband she saw the beautiful God Eros. Caught by surprise, she spilled the oil on his face. Eros woke up and flew away telling Psyche that she betrayed him and ruined their relationship so that they could never be united again. Psyche started searching for her lost love, and finally was suggested to beg Aphrodite, who imprisoned Eros in the Palace, to see him. Aphrodite gave her three impossible tasks to accomplish in order to prove her love. Driven by her desire to reunite with Eros, she was fearless. After accomplishing the first two tasks, Psyche had to go to the Hades (Underworld) and bring the box with the elixir of beauty to Aphrodite, who ordered her not to open the box. Instead of the elixir, there was Morpheus (the god of sleep and dreams) hiding in the box and since the curious Psyche opened it, she fell asleep. Eros found out what happened, run away from the Palace, and begged Zeus to save his Psyche. Amazed by their love, Zeus went even further – he made Psyche immortal so that two lovers could be together forever. Make a great first impression on prospective employers with resume and cover letter. Visit Devmyresume.com and get your professional engineering resumes written by experts. Awesome, amazing, wonderful article! I am writing a research paper on Greek gods and their archetypes and this was a huge help! Thanks! Amazing i was entranced in this article. I love stumble upon for showing me this kind of stuff! Whoever wrote this you should be very proud of yourself. Thank you very much. Her daughter’s name was Pleasure. There is so-o-o-o-o much of her story not here. Read Apuleius. Of course.. but Apuleius is a Latin poet and writer, therefore, his stories reflect the Roman version of mythology, which is quite different compared to Greek mythology. There is no historical record of the Psyche story before Apuleius, and he is generally credited for it’s creation. So it technically isn’t a myth, Greek or otherwise. Technically, or maybe rationally (speaking), I agree with John. But a myth is something that lends us human truth no matter its origin, within or without, legendary or historical. Mythology is a story realm shared by the real and the imaginative, fact and fantasy, body and soul. What about Aeschylus’ version? Aeschylus was a Greek poet and dramatist. What a wonderful love story. 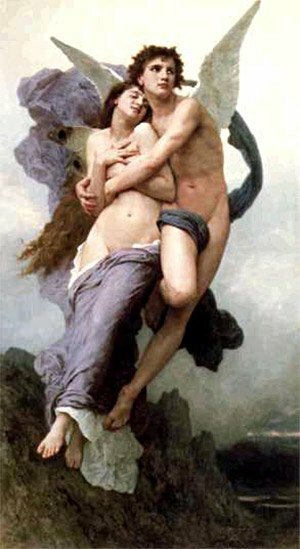 The myth of Psyche and Eros is true love. i experienced the essence of love through isis… and it is quite amazing the power of love divine. immortality is but a small step away when in the light of true divine love. may they live forever! This was amazing. It helped my myth project so much! Thank you! I go on this site and read a lot of these myths but this one has stood out for me. Its a fantastic story and i very well enjoyed it. I agree with you Zen, the power of this myth is very amazing! This myth is similar to something that has happened to me!!!!! Forever freedom and peace, blessed to you Psyche!! I just took Classical History and we somehow managed to never read any myths…. I just downloaded the full version of this to read though! Thanks! This is a true story not a myth. And the love still continues though I am not immortal, still a human living human experiences. Many lifetimes have passed for me since then, but we remain together to this day and have been together for lifetimes before I was Psyche. Of course the true story is quite different from the myth created here, as they usually are. Beautiful nonetheless. This is the story of a love that has lasted for millennia even to today.